I need a touring bike, and I’m on a budget. My old Barracuda AM2, aluminum-framed mountain bike frame is tapped for rear pannier mounts, so perhaps a conversion is in order. As I quickly found out, there’s a lot more to fitting drop bars and a rigid fork onto a mountain frame than I had expected. Hopefully, this will help clear things up for the next person who tries. There’s no point in having that crummy Manitou Pro X suspension fork soaking up all my energy if I’m just touring. Besides, there are no provisions for mounting a rack. A rigid fork is in order. Since this is going onto a mountain bike frame which was designed for a suspension fork (typically around 80mm of additional height), a “suspension corrected” fork is required. The Nashbar fork does not seem to be suspension-corrected. Notice that the Salsa and Surly model numbers seem similar? That’s because they’re owned by the same parent company, Quality Bicycle Products. To my knowledge, the only difference between a fender eyelet/braze-on and a rack eyelet is which side of the fork it’s on. According to everything I’ve read, there’s absolutely no reason you can’t support a rack with a “fender” eyelet. As much as I would love to have Ultegra 9-speed STI shifters like on my Cannondale road bike, I don’t have $300 to spare (also, they aren’t compatible with V-Brakes, see below). Instead, I will use bar-end shifters, which are cheap and rugged. Two Shimano bar-end shifters are currently available: the Ultegra 8-speed shifter, and the Dura-Ace 9-speed shifter. 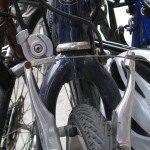 The indexing of the 8-speed shifter is incompatible with 9- and 10-speed derailleurs. However, friction-shifting (non-indexed) mode can be used regardless of the shifter/derailleur combination. Regarding Dura-Ace compatibility, with 8-speed and older setups, Dura-Ace shifters were only compatible with Dura-Ace derailleurs (the pull length was unique). With 9-speed and 10-speed, however, Dura-Ace shifters work with any 9/10-speed Shimano derailleurs. 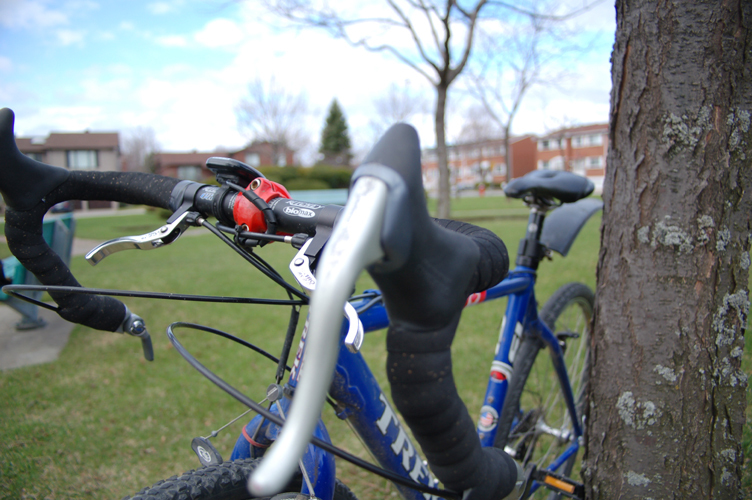 Brake levers come in two types: standard pull and long pull. 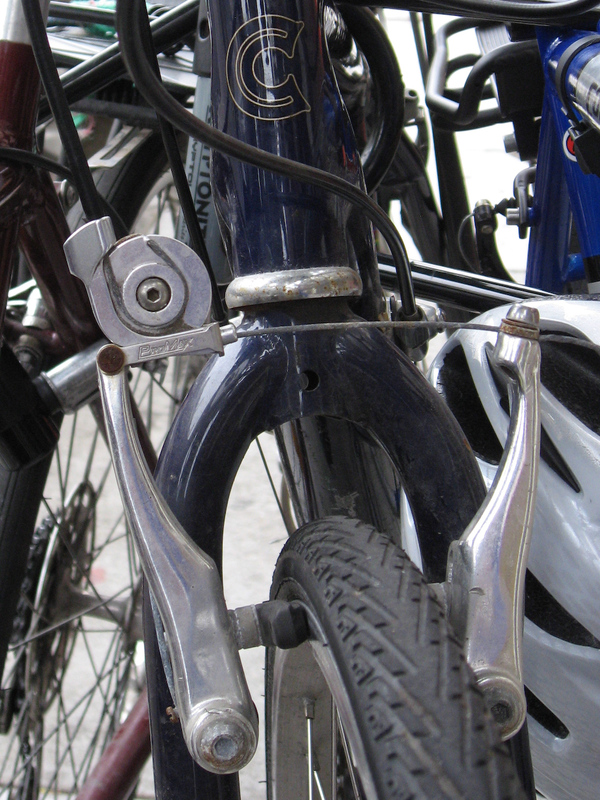 Standard pull levers are for use with classic cantilever brakes. Long pull levers are for use with direct-pull (“V-Brake”) brakes. Normal road levers (such as all Shimano STI integrated brake/shifters) are standard pull and require a pulley system such as a QBP Travel Agent, or a World Class V-Daptor in order to work with V-Brakes. Additionally, while mountain bike brake levers have a built-in cable adjuster, road bikes do not. So, a ‘noodle’ with a built-in cable adjuster will be required, as shown in the Dia Compe 287V photo below. It seems that just about any handlebars will do. Salsa and FSA Omega seem to be popular choices, as listed below. Cyclocross people seem to recommend going about 2cm wider than your usual road bar. Since I’m most interested in touring, I’ll probably go with the same width as my road bikes. The FSA Omega comes standard on all of Co-Motion’s touring singles, which leads me to believe it’s a quality item in spite of its low price. 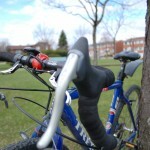 Normally, the shifter cable exits the front of the bar-end shifter, is concealed under a few wraps of tape, then extends forward along the plane of bottom of the drop-bars, and arcs back around toward the head tube, as in the photo to the right (from Arctic Hawk on BikeForums.net). It is also possible to fully conceal the shifter cables by taping them against the handlebar, covered by handlebar tape until near the stem. However, on larger frames, this will require a longer than standard shifter cable for the rear. Cable and housing intended for a tandem bicycle will provide the necessary length. Standard derailleur cables are 1700mm in length, while tandem cables are 3000mm. Some weird terminology that came up while researching this conversion. Brifter – Integrated brake and shifter, such as Shimano’s STI lineup. Bar-con – I have no idea what the origin of this is, but it seems to simply refer to bar-end shifters. I’m in the middle of transforming a Giant granite MTB in a raceable cyclocross bike for next season, I’d love to go out and buy a cyclocross bike new but it aint an option with my budget. I was interested to view your braking and gearing set up, I’d been chasing STI levers on ebay for weeks but this seem a more suitable and easier option. I also like the use of the top mounted brakes. Do you find the bar end shifters easy to use? And do they work with MTB groupsets?